Not quite a “New at SHOT Show” piece, since it came out just before, but cool nonetheless. 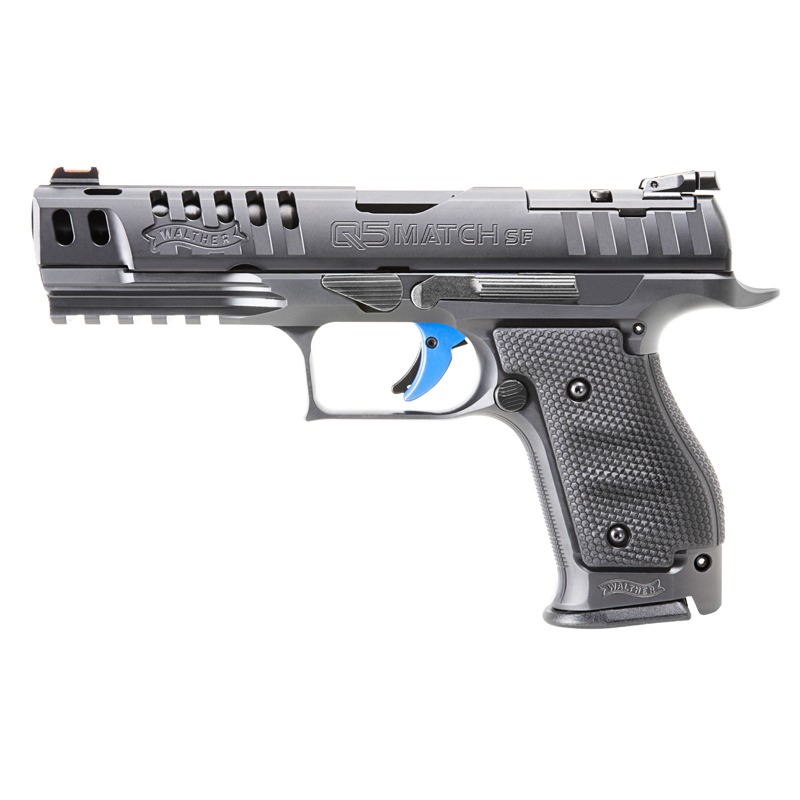 Walther has introduced a new PPQ derivative. They’ve taken their excellent Q5 Match and put it on top of a brand new steel frame. It’s aimed squarely at the competition market, combining the PPQ’s fantastic trigger1 with a lot more weight to soak up recoil. This gun is intended to compete with pistols like the Tanfoglio Stock II and CZ Shadow 2, now that IPSC changed the trigger pull weight rules. Let’s take a look. Let’s talk through the features. It’s got the same slide as the regular Q5. So it’s got slide cuts to look cool, catch your eye in the display case, and keep the slide weight down so they can still use the same recoil assembly as the regular PPQ. It also has a really excellent optics mounting plate setup that’s very sturdy. It’s great at keeping the optic of your choice securely mounted. Factory sights are fiber optic front and black rear, in case you want to compete in a non-optics division. That steel frame is the kicker, upping the empty weight to 41.6 oz. from the 21.9 oz. of the standard Q5 Match. Weight fights recoil. For competition, weight is good. The most popular pistols for Production are steel-framed CZ 75 derivatives. Even in Open, where compensators and porting are allowed, all of the top ten shooters in Open Nationals (and a whole lot more besides) have opted for a steel grip to add weight. The stock trigger is about 5.6 lbs. or so. At least according to Walther. It’s smooth and nice though, so you’ll think it’s lighter. And if you actually wanted lighter, it’s a simple matter to swap two springs to get the pull weight down around 3 lbs. Contact Springco if you’d like a set. A factory magwell is available for the Q5 Match SF as well, should you want one and be permitted one in your competition of choice. Walter’s PPQ magazines are well-designed as well. For those of you interested in loading up, here’s a recipe that should get you 23 rounds. Start with the Walther mag body. Order the Grams spring and follower kit for a P320. Shave the tab off the follower that engages the P320’s slide stop, and it’ll fit wonderfully in your PPQ mag body. Add at TTI baseplate and you’re ready to shred. As for the price, MSRP is a little high, but not unforgivably so at $1,399.99. A bit pricey, but it is a niche market that they’re going for. It’s roughly what you’d pay for a Shadow 2 with all of the Cajun Gun Works goodies. This entry was posted in All and tagged firearms, modern pistols on January 24, 2019 by parvusimperator.